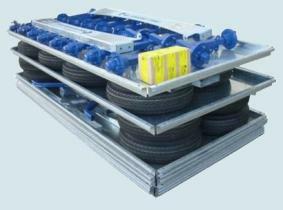 Self tracking trailers have a self tracking wheel system. 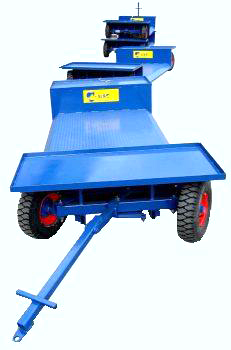 The trailers follow the path of the mini-tractor or tug that is pulling the trailer. Multiple trailers can be connected one behind the other. Tennis complexes, football grounds, athletics ovals, golf courses, cricket clubs. 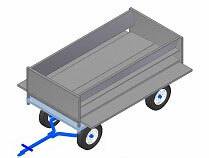 Tugs - What to pull the self tracking trailer with? Tug sizes are dependent on number of trailers to be hitched together, weight of loads, downhill braking, terrain, hills, gullies and slopes, distances to be travelled and turnaround times. Versatility required of tugs e.g. people movers, lawn cutting, and soil moving or is it going to be used solely for pulling trailers. Always give consideration to being able to stop when going down hills with a load of trailers behind. C-Mac, as a standard and custom designed self tracking trailer manufacturer, makes high quality self tracking trailers with a variety of options to choose from. 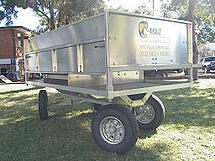 How does C-Mac Self Tracking Trailers work? 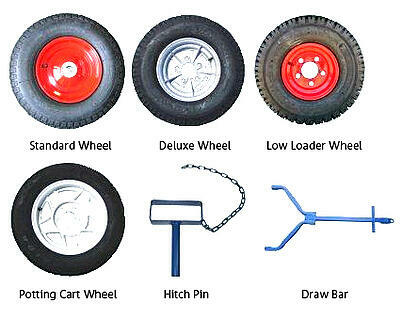 Below is the principle of our self tracking trailers for turning and tracking accuracy. a. 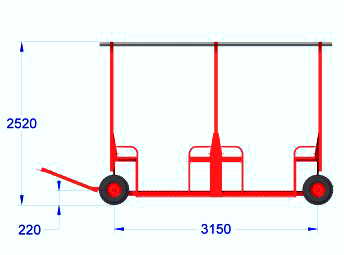 Front and rear axles are joined together by a linking bar so when the front axle is pivoted the rear axle is pivoted in the opposite direction. This means the rear axle wheels track in exactly the same position as the front wheels. b. When several trailers are attached the following trailers follow or track in exactly the same path. Not cutting corners, so the last trailer will not hit walls or plants when being towed. Where ever you can take your tug the trailers will follow. c. Biggest disadvantage is that the trailers cannot be reversed so a drive through situation is always required. Word of caution with multiple decks, load weights is very high above centre of gravity and trailers can roll if not driven carefully and on level ground. Tyre pressure is critical. Technological advancements with 3D Computer Aided Design - greater design capability and more flexibility for customisation. A wide range of custom welding and fabrication services and are also available for all your trailers repair and maintenance. Click here for "Plant & Equipment Finance"
Ideal for use around the farm, garden or nursery. Easily manoeuvre a train of several trailers down narrow paths, around corners and through entrances of potting sheds without the trailers cutting corners. Drawbar, heavy duty, folding, suitable for uneven terrain and different tractors. 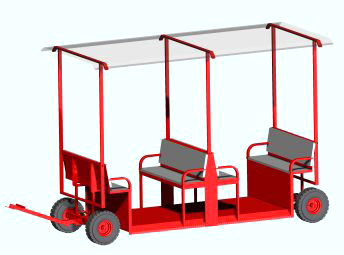 Heavy duty model designed with rougher terrain and tougher work in mind. 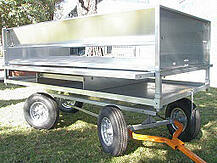 Receive up to $500 from WorkCover NSW after purchasing C-Mac Deluxe Self Tracking Trailer? Most nurseries have a demand for manual potting and/or potting up. Nursery managers can either choose a “potting trailer” “potting station” or a “potting machine”. Why not create multiple uses for a single piece of equipment, utilise your existing (deluxe self tracking) nursery trailer and turn it into a mobile potting station, as needed! 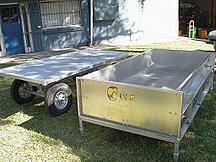 Paul Schroeder from Proceed in New Zealand ordered a deluxe trailer with drop down sides in June 2014. 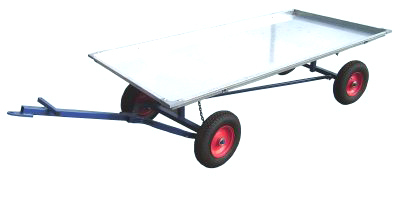 In March 2015 he sent us pictures of his timber hopper on the deluxe trailer which he was using as a mobile potting station citing its great benefits and how well it worked. C-Mac’s General Manager who had seen other nurseries potting off their trailers in the past, thought this might be a handy accessory that could be fitted to any of C-Mac’s existing deluxe trailers. C-Mac’s engineer then drafted up a more refined 3D model to show how to turn a deluxe self tracking trailer into a very handy mobile potting unit. 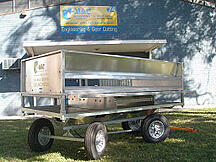 Why Choose C-Mac’s Trailer Potting Station? *Note: total weight carrying capacity is governed by the tyre ratings. Trailer Potting Station can only become an add-on to C-Mac’s deluxe trailer, other trailers are not compatible. C-Mac’s delux trailers have been made standard in welding fixtures for many years so hopper is interchangeable between all trailers. "Having Quality Product, has been part of my family since 1979. Quality, practicality and durability are three words that come to mind. there's a branch in heaven! 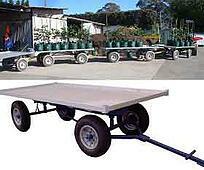 Self tracking trailers follow the path of the prime mover. 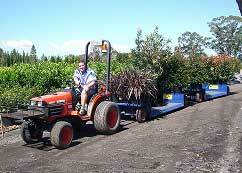 C-Mac low loading trailer helps solve the issues with moving large plants. Manoeuvre a train of several trailers down narrow paths, around corners and trough entrances of potting sheds & dispatch areas. No expensive bobcats or qualified drivers required to move large pots. Frees up bobcats for more important tasks. Reduces running time & maintenance costs on bobcats. (bobcat carries 3 per bucket or 5 per pallet per load). Minimum lifting saves on potential injuries. Clearance is not a problem! Template drawings are available so customers can check clearances and cambers on roadways. Can you move fifty 100 litre pots with tall trees over a distance of 150m in 1 hr and not get a sore back? These trailers will let you do it. Passenger self tracking trailers follow in the path of the prime mover, making possible towing a train of several trailers down narrow paths, around corners and through narrow entrances. Closed cell foam cushions that do not absorb liquids.